Place tortillas in a 10-inch nonstick skillet with 1 Tablespoon of cooking oil over medium-low heat. Warm each tortillas 2 and 1/2 minutes on each side (using more oil as needed). Fry each egg in a skillet sunny side up. Use 1 teaspoon of butter per egg. Do not flip the eggs... cover egg for last 1 and 1/2 minutes to let egg white to firm. Place 1 egg on each tortilla and top with 1/4 cup salsa and 1 Tablespoon cheese. If desired, you could replace the sunny-side-up eggs with scrambled eggs, poached eggs or whatever your preference might be. Here's a fun tip. After one of my recipe tests, my eggs were beautiful but the egg whites weren't cooked through (gross). Frustrated, I threw everything back in the frying pan... eggs, tortillas, salsa and cheese... everything. I angrily scrambled everything together. Here's the happy truth... that was my favorite way of preparing this dish. 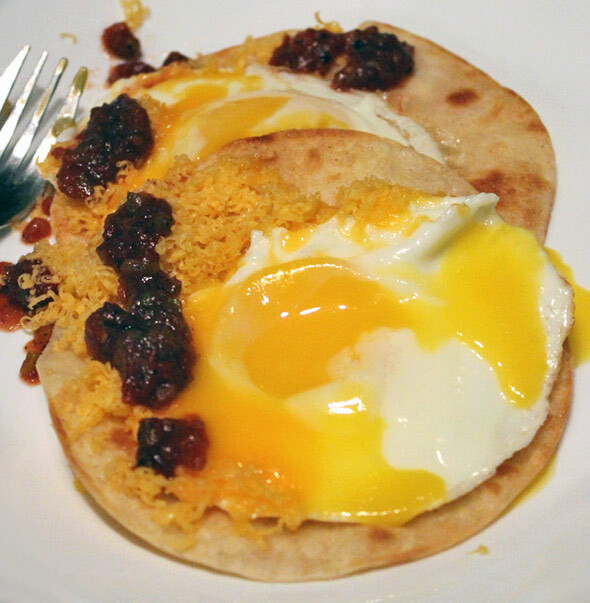 This very easy Mexican-style breakfast is beautifully fried eggs on a crisp tortilla with salsa and cheese. Recipe number 846. Submitted 3/28/2003.